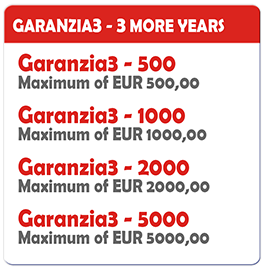 GARANZIA3 COVER is the Technical Assistance Service aimed to cover a single repair only in the case of accidental damage or to the product refund. The purchase of GARANZIA3 COVER is, actually, cheaper than a repair for accidental damage. In case of accidental damage, GARANZIA3 COVER gives you the right FOR a single repair within the first 12 months from the product purchase date. 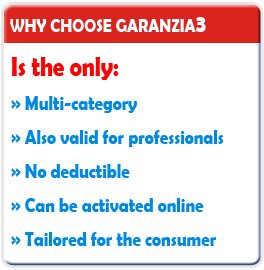 GARANZIA3 COVER must be activated no later than 7 days from the product purchase date. 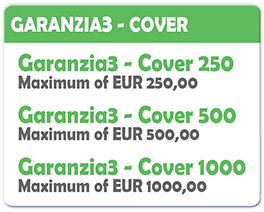 To better respond to the customer needs, GARANZIA3 COVER has 4 types of products depending on the coverage cap, which is the maximum sustainable cost for each intervention. Contacting our Customer Service to receive all the details of our service is extremely simple: just call our toll-free number 800 090737 (from Mon to Fri from 10:00 to 17:00).